If you are a landlord in the state of California and a current or former tenant sues you for monetary damages what do you do? The first thing a landlord should do if a tenant sues is to review the tenant’s file to ensure that the information in the file is up to date. Gather all the information you have on the tenant in one place for easy access. The landlord will also need to find and review all insurance policies that it has on the property. Most general insurance policies that cover rental properties will provide coverage to the landlord if he/she/it is sued by a tenant. It might also be wise to have an attorney review the insurance policy(s) covering the rental property on a periodic basis to help the landlord understand the coverages and exclusions. Don’t wait until you are sued to determine if you have coverage on rental property. If the landlord has insured the rental property and has general liability coverage the landlord must immediately turn over the lawsuit or claim to their insurance agent/carrier. Any delay in turning the claim or lawsuit over to the agent or carrier could result in a denial of coverage. Sometimes the claim by the tenant is so small and the amount that that the landlord must pay before the coverage kicks in is so large (called the deducible) that the landlord does not want to turn the claim/lawsuit over to their insurance carrier. If that is the case do not delay in hiring an attorney to represent you in the matter. It is never a good idea for the landlord to handle any claim or lawsuit filed by a tenant on their own. This is true even if the tenant is presenting a claim or a lawsuit that is worth under $10,000.00 which is the jurisdiction for Small Claim matters. The attorney, while not being able to appear at the Small Claims Trial, can never the less, assist the landlord in how to prepare for the trial, collect and organize the evidence for the landlord, and perhaps, if needed, prepare a trial brief for the landlord to be signed and presented by the landlord that would discuss the law and relevant facts. One of the most frequent claims that a landlord may see is that the landlord failed to comply with Civil Code Section 1950.5 which requires the landlord to send a Security Deposit Disposition to the last known address of the tenant within 21 days after the tenant vacates the rental property. If deductions have been taken from the security deposit, the landlord is required to provide documents and receipts showing the actual charges that were incurred – materials, labors, cost of hiring someone to do the work, etc. If the work has not yet been completed, the landlord is required to deduct a good faith estimate as to the cost of the work. The landlord’s failure to do so will expose the landlord to claims for the willful non-compliance with Civil Code Section 1950.5 and monetary damages that could include up to three times of the Security Deposit. 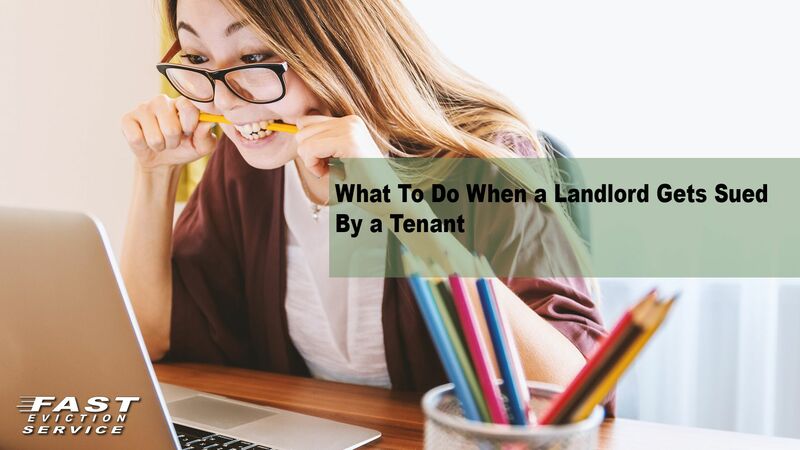 The allowable deductions from the Security Deposit may include unpaid rent, painting and cleaning, and repairs to damages caused by the tenant to the rental property that goes beyond normal wear and tear. If the landlord fails to comply with Civil Code 1950.5 the landlord is exposed to a civil lawsuit and other penalties that could include monetary damages of up to three times the Security Deposit. The second most common claim that a tenant will bring against their former landlord is for the alleged breach of the warranty of habitability. This type of lawsuit is very serious and if found true could expose the landlord to thousands of dollars in monetary damages. To protect against this type of lawsuit the landlord must do periodic inspections o the rental property; require the tenant((s) to provide the landlord with written work orders and repair requests. The landlord must have a practice and procedure in place for responding to any work order and repair requests. If a landlord is sued for breach of the warranty of habitability and is served with a Summons and Complaint the landlord must file a response to the lawsuit within 30 Days after being served. Delay can be very costly. That is why the landlord must know if he or she has insurance coverage against such claims and immediately tender the claim or lawsuit to their insurance company and/or to their attorney for review.